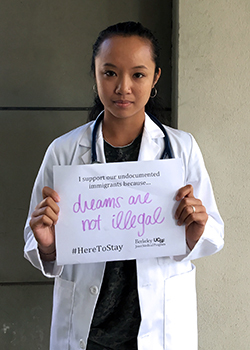 Medical students from the UC Berkeley-UCSF Joint Medical Program (JMP) recently participated in a photo campaign to support the undocumented immigrant communities affected by the repeal of Deferred Action for Childhood Arrivals (DACA). This campaign is part of the #HereToStay campaign initated by Protect Our Patients, a grassroots movement of future health providers advocating for equitable healthcare access, and UndocuMed CA, a coalition of medical students in California advocating for the health and human rights of DACA recipients. "As future physicians and leaders in the medical field at the UC Berkeley-UCSF Joint Medical Program (JMP), we stand with love and in solidarity with the undocumented immigrant communities affected by the recent repeal of Deferred Action for Childhood Arrivals (DACA). They are our colleagues, our patients, and a key fabric of the communities we serve throughout the Bay Area. "Our decision as medical students at the JMP to openly support DACA is simply one of responsibility. Though doctors have traditionally taken an oath to 'do no harm', we believe the responsibilities of a doctor must go beyond this promise to also seek justice for those we serve and amplify the voices of those who have been deliberately silenced by society. As future doctors training at the JMP, we are committed to showing support for DACA to our peers and patients by advocating for the health and wellbeing of all, especially those who are most in need and marginalized in society. "DACA gives young people, brought to the United States as children of families in search of a better life, temporary protection from deportation and renewable 2-year permits to work and study in the United States. Currently, 800,000 undocumented young Americans, nearly a quarter of whom live in California, benefit from these protections. The repeal of DACA threatens the ability for these young people to obtain stable livelihoods for themselves and their families. As doctors, we support DACA as a critical piece of legislation that is the first step in helping undocumented communities acquire stable legal status and employment, both of which are key to improving health outcomes and wellbeing. "In addition, at least 65 medical students across the United States protected under DACA will not be able to achieve their dreams of becoming physicians if Congress does not act. We believe our colleagues have the right to live free from fears of deportation and affirm the value of their perspectives and life experiences in transforming and innovating medicine. Our colleagues deserve to learn and serve as doctors. "At the JMP, many of us have regular interactions with undocumented communities in our training at hospitals, clinics, and community organizations that advocate for the underserved. Through our preceptorships, we learn the basic skills, knowledge, and practices necessary for medicine through caring for and learning from DACA recipients and undocumented communities. We join with the leadership of Highland Hospital and our colleagues of the Alameda Health System in affirming that safety-net hospitals and clinics serving the most vulnerable of our society are safe spaces for undocumented immigrants. "DACA has been a key step forward in guaranteeing undocumented youth the human rights to health and living free from fears of deportation. We believe that seeing the humanity in others does not depend on legal status as the arbiter of truth. Love, kindness, and compassion have no borders. As future doctors, we will continue to advocate for a future that ensures health equity and justice for all."